This positive, self-help book for wealthbuilding differs from others because it combines common sense principles with practical financial applications and personal goals. Simple, easy-to –understand, it is by no means simplistic or superficial. 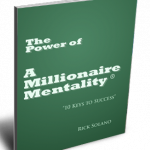 Free from trendy fads and ideas, The Power of a Millionaire Mentality® is written to last – a resource filled with sound principles readers can turn to again and again. Most of all, ethics and values don’t have to be sacrificed to achieve financial freedom. The author celebrates a life lived in balance between the physical and the spiritual. And as is the case throughout the book, whether it is making money, investing wisely or improving your health, Solano doesn’t just tell you – he shows you the process to achieve the goal. No more procrastinating! The book contains forms to be filled out that become a framework for action and blueprint for change. They take you through a step-by-step process from identifying the source of your pain to developing a plan of action to assessing your current financial situation. In addition, easy-to-follow charts, tables and examples are provided to illustrate the points the author is discussing, especially in the financial chapters on Money and Compounding, Mortgages and Real Estate. Wolf, Sheep, Ram, or Shepherd: Which one are you? This brief but compelling tape summarizing Solano’s core success concepts is ideal to use during drive, workout, down time or… any time! Listening to this encouraging, motivational tape just once a day for 30 days helps you make success a driving force in your life. Get started on your way toward becoming a millionaire for less than $30. Without question this is the best investment you will ever make.